Stepping out of the airport in Luxor was a breath of fresh air, really fresh air. 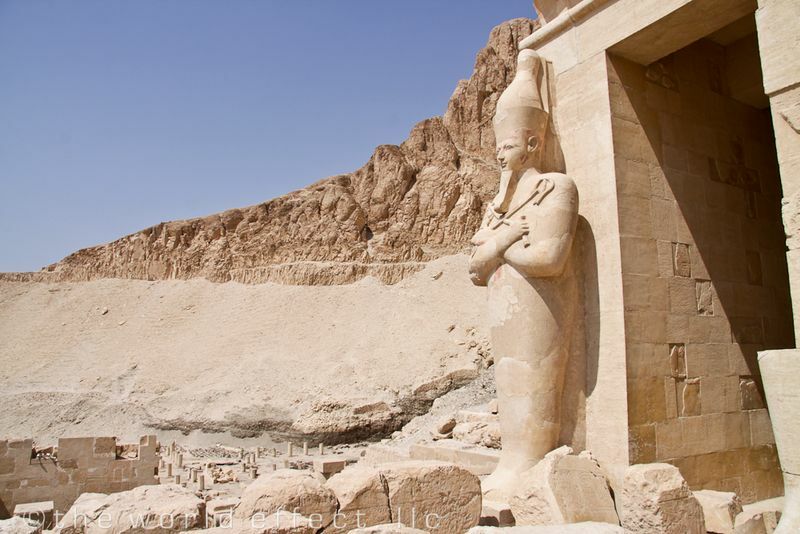 Luxor sits in what they call upper Egypt which actually means up river or south on the map. It has a night and day difference compared to Cairo. There really isn't any traffic to speak of, the sky was crystal clear, and the energy in general was taken down from the frenzy of Cairo to an island time feel. The city is beautiful with the lush vegetation and blooming flowers that line the roads. The Nile valley is very fertile and lush. It's amazing when you drive just 10 minutes away from the river bank you enter a whole other world of a barren desert. 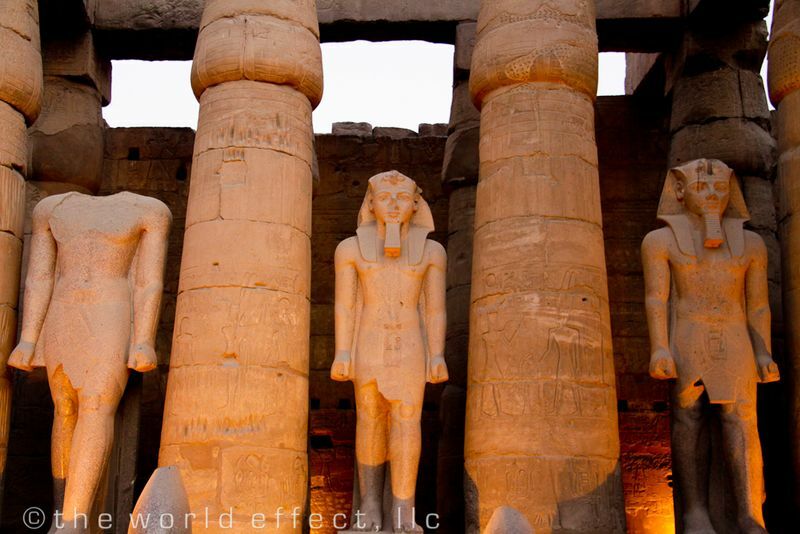 Luxor is rich with historical sites and artifacts. 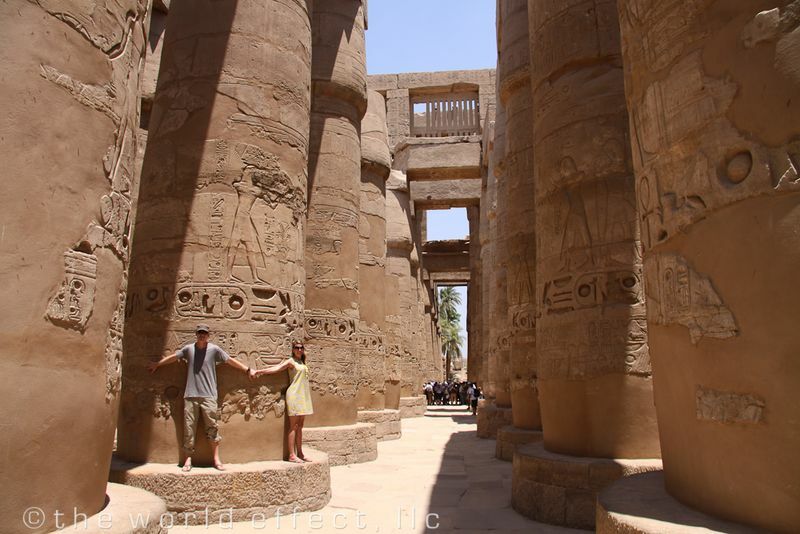 Our guide said that Luxor contains about 30% of all of Egypt's historical sights. We saw a total of four sights while we were there and they were so impressive and pristine they looked fake, almost like replicas. We would have loved to hang out at each sight for longer but the "mild" temperature as our guide described it was a little unbearable to stand for much longer than an hour at a time. Wile we were there it was about 41 C (106 F). He said that the week before it got up to 50 C (122 F). 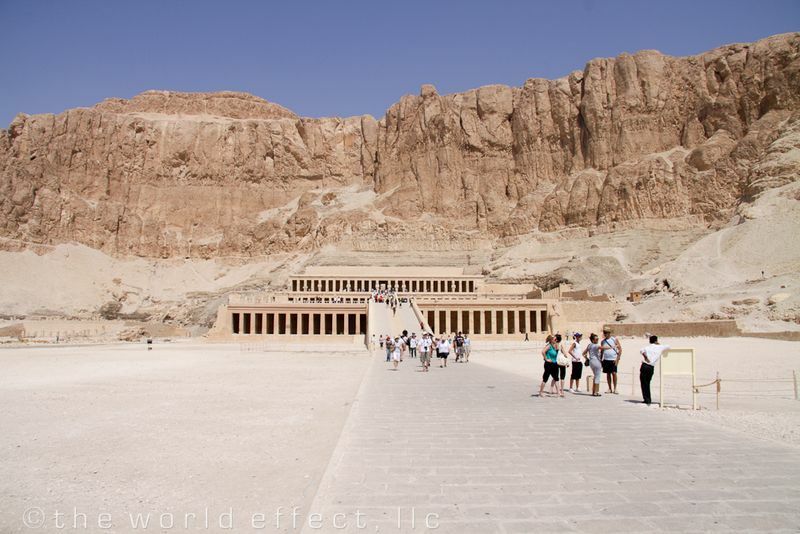 The first sight we visited, intentionally in the morning, was The Valley of the Kings. By 9 AM it was easily over 90 F in the baking desert canyon. 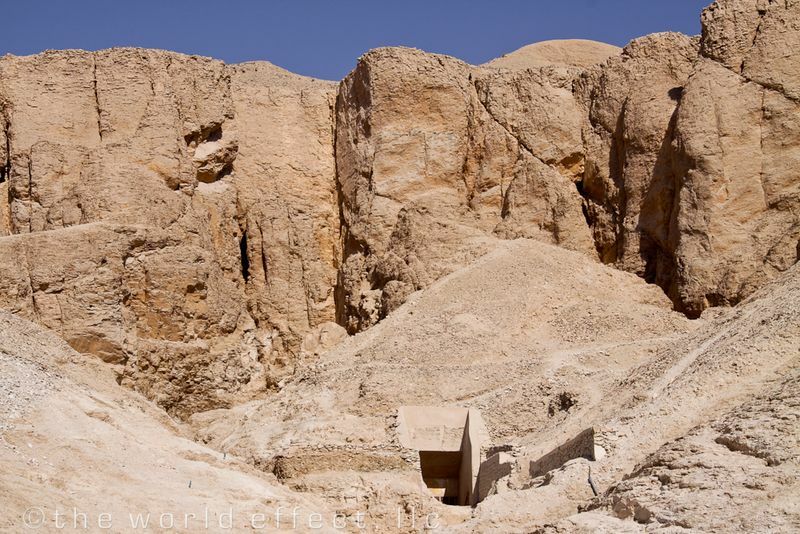 It is said that the climate was one of the reasons why the Pharaohs used this location for their tombs. The lack of moisture helps with preservation. The tombs are nearly perfectly preserved all the way down to the bright colors used to paint the walls and ceilings. We climbed down into several of the tombs. Our personal favorites were Ramsey IV and Ramsey IX. Unfortunately, they do not allow photography. Sorry. The next stop was the Al-Deir Al-Bahari Temple. This temple was built by a woman ruler. She became the ruler by having priests convince the public that she was a daughter from the gods, an oracle. Interestingly, her estranged step-son who later became the leader, ordered that her name be chiseled off everything in the Temple. This sight was very interesting, although the most entertaining event was when Meg and I were beat-up by little old Chinese tourist women. They were worried that there wasn't enough room for their whole group to fit on this little golf cart train ride up to the sight. They took matters into their own hands, one little lady gave me a good jab in the ribs and another was batting off Meggan with her sun umbrella. It turns out that the golf cart train was only half full, so they relinquished their assault on us and allowed us to ride along. I guess living in place with a third of the world's population, saving a seat has a whole new meaning. 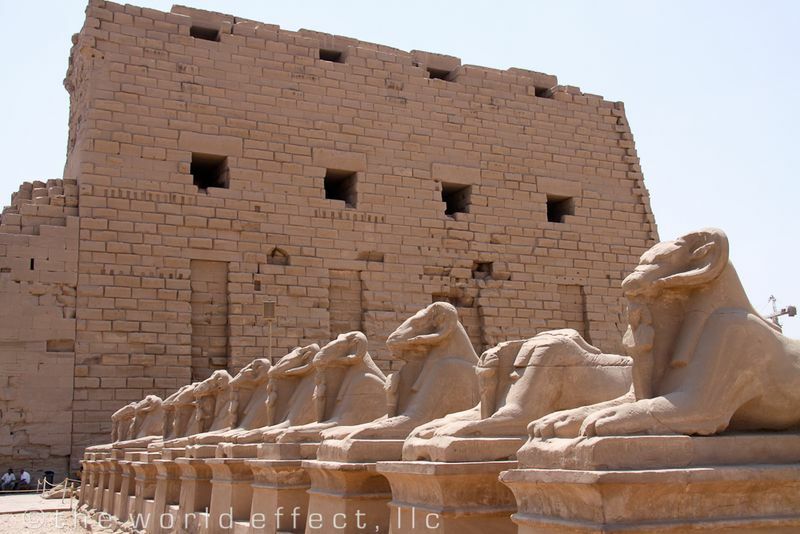 The Karnak Temple was our favorite sight in Egypt. 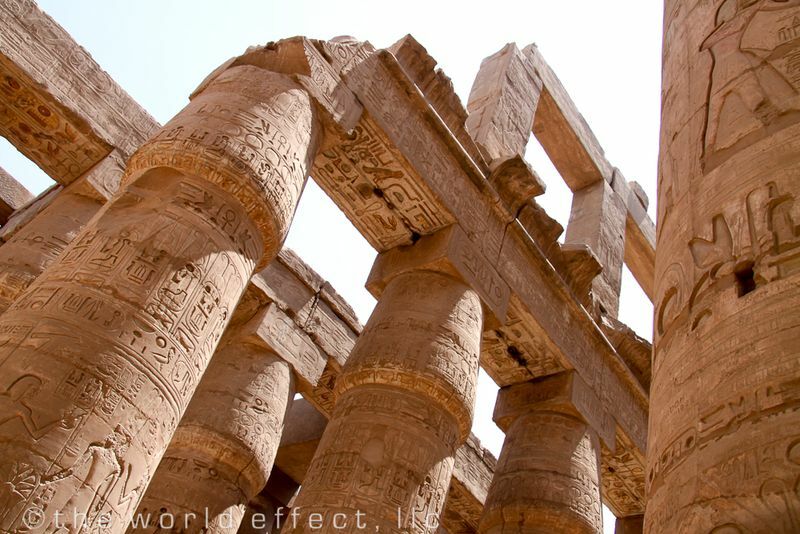 It is a massive complex of columns, pylons, statues and temples. 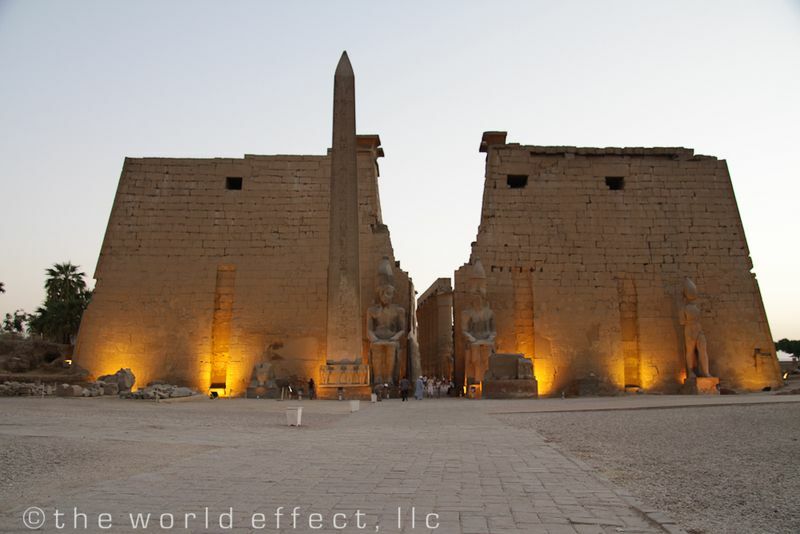 This sight once reached all the way to the Luxor Temple on the other side of town, which they plan to restore. The shear scale of the elements in the complex were amazing. This place is an engineering feat. The Luxor Temple was our last stop. We reached it by sundown and stayed until the flood lights came on. With it being lit up and in the middle of town, surrounded by hotels and restaurants, it was hard to believe we were looking at the real thing which is over 3000 years old. The hieroglyphics on that picture are so beautiful, to think of all the owrk that must have went into those carvings is mind blowing. 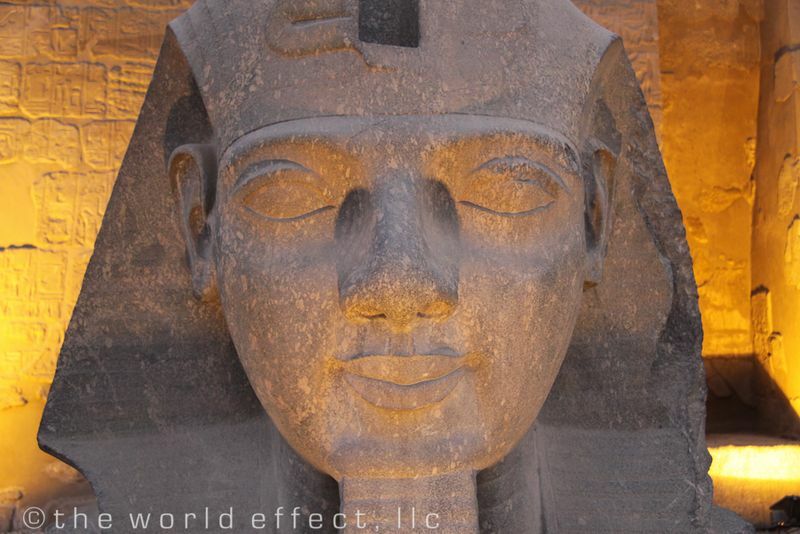 These pictures of Luxor are beautiful. 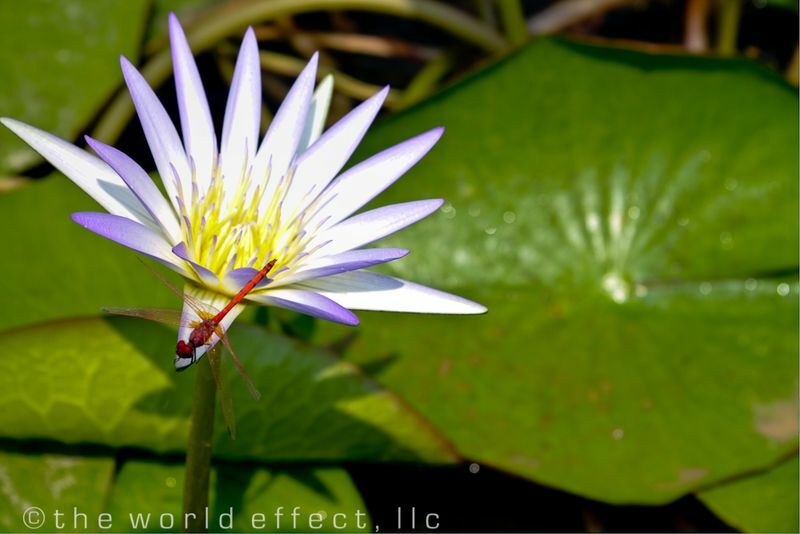 The lilies are also a surprise for most people because most people see egypt as a desert forgetting that the nile supplies egypt with fresh water.